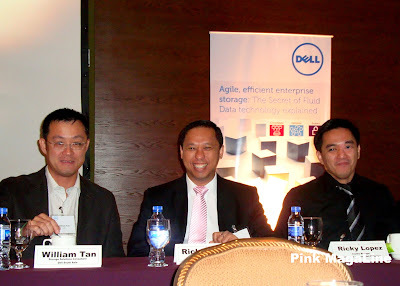 Last Tuesday, October 4, 2011, in a media briefing held at New Wolrd Hotel in Makati, Dell announced its new storage solutions build on its Fluid Data Architecture. From L to R: Mr. William Tan, Storage and Solutions Consultant for Dell South Asia, Mr. Richard Teo, President of Dell Philippines, and Mr. Ricky Lopez, Country Manager of Commercial Business - Dell Philippines. \Mr. 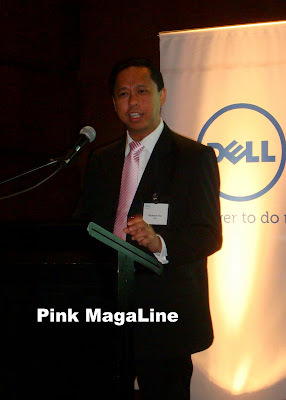 Richard Teo, President of Dell Philippines, gave the press a warm welcome and an introduction of Dell's IT strategies. I know this is something technical and a little off to my usual posts, but here's the press release for the techie minded. Read on. MANILA, Philippines, October 4, 2011 – Dell announced new solutions built on its Fluid Data Architecture to optimize cost, performance and protection as storage scales with a growing organization. Highlighted solutions include its Dell Compellent 16Gbps Fibre Channel interoperability and new Dell EqualLogic Unified storage. With Dell Compellent, enterprise data is actively, intelligently managed throughout its lifecycle so enterprises can constantly adapt to changing business conditions. Together, a Fluid Data™ architecture,storage virtualization, intelligent software and modular hardware bring unprecedented efficiency, simplicity and security to enterprise storage. Data center resources are utilized to their full potential.Built-in intelligence and automation ensure data is available when and where it’s needed. And an open, persistent hardware platform scales in line with business needs to protect storage investments over thelong term. 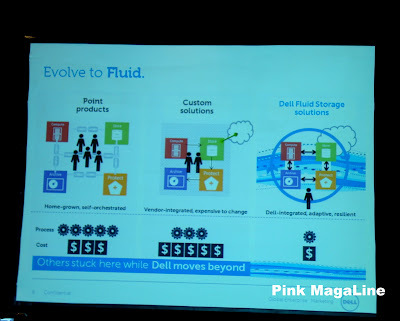 These solutions represent a milestone in Dell’s vision for a Fluid Data Architecture designed to help customers efficiently and flexibly manage data. Dell is uniquely unencumbered by legacy storage technologies and rigid philosophies that do not support customer needs in the Virtual Era. Instead, Dell is focused on the development and acquisition of storage intellectual property that delivers productivity and efficiency gains for highly-virtualized data centers. "Organizations of all sizes continue to place a priority on boosting IT asset efficiency while improving IT responsiveness to business pressures. Ever greater exploitation of virtualization is a key element in these efforts, and the deployment of flexible and intelligent storage systems is frequently the key to successful efforts," said Richard Villars, vice president of storage and IT Strategies at IDC. "Dell's continued investment in advanced yet cost effective storage solutions along with a continued expansion of its enterprise service and solutions organization, puts the company in a strong position to help IT organizations get the most from their data centers, today, and in the future." Dell has successfully demonstrated compatibility between a Dell Compellent Storage Center SAN with Brocade 6510 16Gb Fibre Channel switch and Brocade 1860 16Gb Fabric Adapter. Dell will continue to build on its leadership in enterprise storage by introducing 16Gbps Fibre Channel offerings. This new technology will help customers unleash the power of their SAN environments to support next-generation applications and cloud services. This increased performance will provide organizations investment protection and a future-ready infrastructure capable of overcoming the challenges of enormous data growth. By combining Dell's Fluid Data architecture with Brocade's 16Gbps Fibre Channel infrastructure, Dell is delivering high performing SAN solutions that empower customers to stay at the leading edge of technology. In support of customers’ growing storage demands, Dell has begun shipping the new EqualLogic FS7500, the company’s latest NAS solution that works with EqualLogic PS Series arrays to deliver the only scale-out, unified storage platform for mid-size deployments. The EqualLogic FS7500 uses the Dell Scalable File System, a high-performance, clustered file system based on Dell intellectual property. The Dell Scalable File System architecture incorporates features formerly found only at the very high end including advanced caching, load balancing and multithreading for fast I/O processing. This is the first step toward Dell’s long-term vision of a uniquely feature-rich, highly-scalable file system. Customers consolidating applications onto a unified platform are demanding improved flexibility, to react to unanticipated changes in their application environment; flexibility not delivered by legacy unified solutions. As the EqualLogic unified storage platform provides online capacity and performance scaling for both file and block interfaces, customers can easily scale their platform in any dimension to meet business requirements. Quotes: “We continue to transform our storage business through acquisitions and developing our own intellectual property. Our Fluid Data Architecture provides a strategy that helps customers lower the complexity and cost of managing their data. Today’s announcement marks significant progress in delivering on that strategy.” said Richard Teo, President, Dell Philippines. Join Spoil Your Sole in Rio Contest!